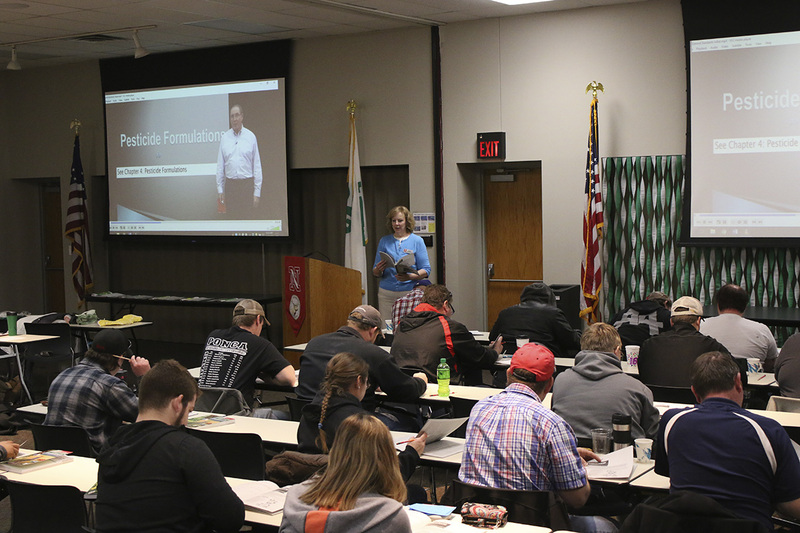 A 2018 Commercial/Noncommercial applicator training presented by Extension Educator Sarah Browning. If you have a pesticide applicator license expiring April 2019 — either private or commercial, or you need to get a new license — trainings begin soon. Commercial/noncommercial pesticide applicators are professionals who apply restricted-use pesticides for hire or compensation. Anyone who applies pesticides to the property of another person, either restricted- or general-use products, for control of pests in lawns, landscapes, buildings or homes must also have a commercial pesticide applicators license. Public employees (those employed by a town, county, state) applying mosquito control pesticides whether restricted or general use, must also hold a commercial or noncommercial certification. Commercial/noncommercial applicators have four options to recertify or get a new license. Cost is $80 per participant if you pre-register; $90 per participant at the door. It is highly recommended you obtain and review the written study materials prior to attending an initial training. This will greatly improve your chances of passing the written examination. Study materials for all commercial categories must be purchased online at http://pested.unl.edu (click on “Classes & Study Materials”). Testing-only option — Take a written, closed-book exam given by the Nebraska Department of Agriculture. Visit http://www.nda.nebraska.gov/pesticide/applicator_testing.html or call 402-471-2351 for statewide dates, times and locations. Free. Crop Production Clinics (recertification only) — Categories Ag Plant, Regulatory or Demonstration/Research can use this option. See information under Private Applicators. Private pesticide applicators are farmers or producers raising an agricultural commodity on land they own or rent. Or an employee making pesticide applications on their employer’s farm. Private applicators have five ways to recertify or get a new license. Traditional training classes — visit http://pested.unl.edu and click on “Classes and Study Materials,” then “Private Training Schedule” for dates and locations. Cost is $40 per participant collected at the door. No pre-registration required. • Tuesday, Feb. 19, 9 a.m.
• Tuesday, Feb. 19, 1 p.m.
• Thursday, Feb. 21, 6 p.m. Crop Production Clinics — These were held in January. NEW online private self-study program — An online training can be found at https://psep.education/applicator. This is a 100 percent online, self-paced training with 10 modules. There are questions within the modules and a score of 100 percent is needed to pass. Cost is $75. Self-study manual — Purchase a self-study manual from your local Nebraska Extension office. Answer the questions in the back of the book and return the test to the Extension office. Extension staff will check your answers. Cost is $60 per manual. This method is being phased out in 2019. Testing-only option — Take a written, closed-book exam given by the Nebraska Department of Agriculture. See list of sessions under Noncommercial Applicators.